If you’ve been thinking of adding HBO/Cinemax to your TDS TV package, right now is a great time to subscribe. For a full year, you’ll pay half-price for HBO and Cinemax. Subscribe today and you can watch some of the highest-quality TV shows and feature films available. On Cinemax now is disaster epic Deepwater Horizon starring Mark Wahlberg and Kurt Russell, and outrageous comedy Get Hard starring Will Ferrell and Kevin Hart. Also, don’t miss HBO’s Game of Thrones, which kicks off its seventh season on July 16. This offer is only good through the end of July, so call 1-855-612-0115 now. Check out these additional HBO and Cinemax programming options. In the third and final season of HBO’s The Leftovers, it was more than three years ago when 2% of the world’s population inexplicably vanished—140 million people, gone in an instant. No country, no state, no city was spared, except for one small town in eastern Texas. Population: 9,261. This is the setting of a tale of two families: the Garveys and the Murphys, whose lives seem to have been spared from an event that shook the rest of the world. In this high-tech, modern community, HBO’s Silicon Valley, has the most qualified people to succeed but are the least capable of handling success. Mike Judge (Office Space, Beavis & Butthead, King of the Hill) brings his irreverent brand of humor, and his own experiences working in Silicon Valley, to the award-winning comedy now entering its fourth season. Former Senator Selina Meyer (Julia Louis-Dreyfus) has accepted the call to serve as Vice President of the United States. The job is nothing like she imagined. HBO’s Veep follows Meyer and her staff as they attempt to make their mark and leave a lasting legacy, without getting tripped up in the day-to-day political games that define Washington. The show is in its sixth season. If you’ve wanted to get into HBO’s Game of Thrones, you can binge watch the first six seasons and catch up as season seven returns July 16 when the struggle for the Iron Throne continues. From the south, where heat breeds lusts and intrigues, to the east, where a young queen raises an army, while, in the frozen north, an 800-foot wall of ice precariously protects the war-ravaged kingdom from the dark forces that lie beyond. An original series based on George R.R. Martin’s best-selling ‘A Song of Ice and Fire’ series. Jason Bourne, The Wizard of Lies, Storks, Sully and The Immortal Life of Henrietta Lacks all are on HBO, which also has sports, documentaries, comedies and children’s programming. Everest, The Martian, Stuck on You, Zoolander and Dumb & Dumber are now showing on Cinemax. HBO/Cinemax half-price offer ends 7/30/17: Valid for new subscriptions only. After 12 months, current rates apply. HD premium channels require an HD programming subscription. Local and state sales tax and other fees and charges may apply. 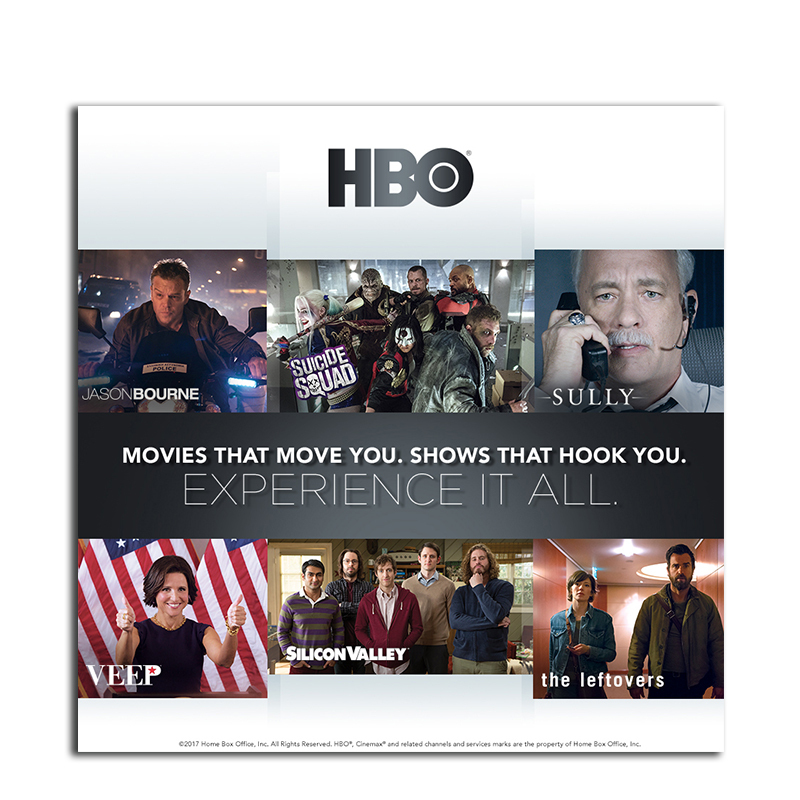 HBO®, Cinemax® and related channels and service marks are the property of Home Box Office, Inc.